Caden Bosch is on a ship and it's headed to the deepest part of the ocean. There's a captain and a parrot and he sometimes dreams of a place called the White Plastic Kitchen. Wait, no. He's in high school and lives with his parents and likes to draw. The truth is that Caden is not sure what's real anymore and things are getting worse and everyone is worried about him. 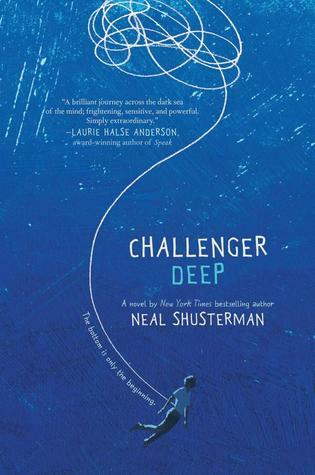 Challenger Deep is written the way that Caden is experiencing it, as though all of it is equally real. Sometimes, there is crossover and it's possible to recognize certain elements in both of the parallel stories. It's very disorienting, as I imagine mental illness can be. This is a book that I appreciated more than I liked, mostly because it wasn't very fun to experience. It was difficult to get into because it was so unclear what was going on, but eventually I got acclimated and starting liking it more. As I mentioned some elements appeared in both stories. Much of what was in the hallucinated world came from the real world, and though some of the characters were easily identifiable as alternate versions of each other some were less clear to me. I also swear there were times that Caden experienced something in the hallucinated world before he experienced it in the real world. But maybe not. This story made me pretty unsure of everything. There were also parts where he would be experiencing something in one world and it would suddenly but seamlessly morph into the other world. For instance, a character named Carlyle was mopping the deck of the ship as he talked with Caden, and after emptying his mop bucket, he continued speaking and closed his laptop as Dr. Carlyle. It was really very cool when it happened. The author's son, who illustrated the novel, has battled mental illness himself. I imagine he was a source of great insight as his father tried to create a novel that would accurately represent what mental illness feels like. And he did a great job - I mean, I don't know how accurate it is (though I imagine there are as many different flavors of mental illness as there are people), but it definitely felt disorienting and confusing and each story felt as real as the other. The writing was pretty sophisticated and effective at conveying these feelings. This is a book for teens and, as I often do, I wonder what teens think of it. 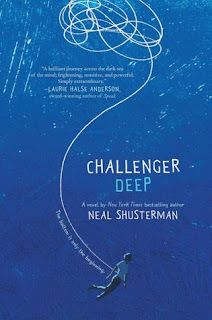 It had a very different feel from the other book by Shusterman that I've read (Unwind) and although I didn't find it as enjoyable to read, the story was better constructed and the main character maybe more real. I would recommend it to anyone who wants to read more about mental illness and appreciates unusual storytelling.